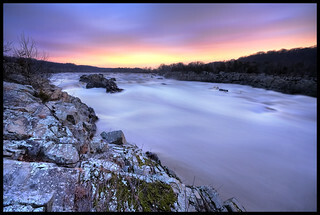 Got to the Virginia side of Great Falls just in time to catch the first light of the morning. I had to use a flashlight to find my way down to the overlook, but once I got out on the rocks the sky was just barely light enough to see without it. The water was still extremely high and moving fast. This shot is a combination of two shots, one for the foreground, one for the background rocks, trees and sky. I also did some recovery on the sky because it was still too muted even after blending the two exposures.